Zombies. Sure, why not? – Hey, Look! A Writer Fellow! Yep. I did a “Plants vs. Zombies” stamp for my son. But it turns out you would’ve been right! I am noodling around with a young adult zombie novel! That said, you still had no right to burst into my house unannounced. Call first. One of the many things I love about the blogging world is how it pushes my brain in new and exciting directions. The bloggers I follow all see the world a bit differently than I. Being in the company of such people always gets my creative juices flowing. Carpet slippers are not very good at negotiating asphalt shingles. Not that Ethan had much time to consider his footwear – or much else for that matter – as he scrambled up his downspout in a groggy panic. What was worse was that he had no one to blame but himself. He heard the warnings that accompanied the weather forecast on the evening news but was too lazy to pull an all-nighter. “I’ll board up my windows first thing in the morning,” he thought. But he overslept, and now his house was full of loitering zombies who were leaving trails of blood and pus all over his hardwood floors. The weather was beautiful, however. The sun calmed him, and Ethan soon discovered that, despite the dozens of undead squatters on the floors below, he could still find a little serenity on this most unusual spring day. It was a fun exercise and I found the result promising. Over the next few months I began to think about Ethan and wonder what his life was like before he found himself stranded on his roof. So, when I wasn’t writing at my day job, or writing picture book manuscripts at night, or doing the husband and father thing (which is rewarding beyond measure, but keeps my word counts alarmingly low), I scribbled a few notes and banged out a few scenes. The first report took up no more than four column inches of the Dogwood Dispatch and could be found on page A17, wedged between a story about the township’s scuttled plans for a roundabout and the particulars of a newly-approved pooper scooper law. An unconfirmed report relayed by an unnamed orderly at the Sunnyville Eldercare facility spoke of an unnamed old woman leaping from her deathbed to attack an unnamed night nurse by gumming her forehead. The police were called. The woman was taken away. No one was hurt. And, as far as anyone knew, the old woman was never seen again. That was all the news Silas Johannes needed to read. Silas was a remarkable man for two reasons: First he was able to read the Dogwood Dispatch all the way to page A17 without falling into a deep, drooly sleep. Second, he was adept at reading between the lines. Where everyone else would’ve read nothing more than an unconfirmed story about a toothless old lady attacking a nurse – if everyone else read up to page A17, that is, which they most certainly never did – Silas saw an origin story, the beginning of what would become a national crisis. There was no time to peruse page A18. There was work to be done. Even though Silas had been up since 5 AM and was exhausted beyond measure, even though the streetlight had just winked on and he had difficulty driving at night, he didn’t hesitate. He hoisted his ample frame up from his La-Z-Boy and fumbled for his keys. He then eased into the family hearse and headed straight for the Home Depot. Since you fine folks know what a comments section is for, feel free to critique until the cows come home. Thanks, Margarita! The Dogwood Dispatch may not have good reporting, but at least the portions are large! All that energy to get to Home Depot…but he didn’t actually get started on the project? Home Depot shopping will do that to you, but at what cost in this case?!? You are braver than I…I hate zombies and can’t wait for the zombie craze to die…if they can die. My off the cuff critique…too many unnamed people in para. 2 and in para. 4, you lost me after the light winked, an adjustment could fix that up. Otherwise, you’re a gifted writer and that mean old teacher who recognized your talent was spot on. Oh, and loved the hearse! Thanks for the thoughtful comments, Mrs. P! You have a point about the “winking;” lights wink out rather than on, don’t they? The bit about the unnamed folks is meant to serve as a commentary on the quality of the Dispatch’s reporting – and is laying the groundwork for some future plot points (that is, if my outline continues to be followed). I do see your point, however; the paragraph gets a little gobbledygook-y and feels a little too clever for its own good. I tend to overwrite in early drafts. Oh, I get it now. A little rejiggering may be in order. I just finished reading Danger in Dinosaur Valley and it’s an awesome book! I’m going to send it to my grandson who has actually been to a Giant’s game…not the World Series. I’m sure he will love it. Thanks for the recommendation! Wonderful! Here’s hoping the little guy likes it! I heart zombies. Ooh, it’s Sunday – The Walking Dead is on tonight and Being Human on tomorrow! Do pick up Mira Grant’s Feed series. The fact that I am writing a story about zombies is ludicrous, really. I don’t even have a working knowledge of zombie lit or zombies on film. I have only two points of reference: Romero’s marvelous 1968 version of Night of the Living Dead (which is the only horror film I watch for pleasure) and the surprisingly thorough Max Brooks book, The Zombie Survival Guide. I vote for draft first then further education. I worry too much research first will taint what your mind can imagine. You have all the basics you need – people come back to life and their only instinct is to eat brains. Sometimes they moan. You’re golden. I’m with you. That’s the way I’m goin’. The blog-o-sphere (your blog included) is a wonderful source for some outside-my-comfort-zone creative thinking. For example, three blogs I follow recently prompted me to write poems, which, I can assure you, is not my strong suit. Love it! And I certainly want to know what happens! Thanks so much Susanna! (If I had read your writing contest post earlier, by the way, I would have submitted a “Springtime for Zombie” manuscript. 1) Although the whole list of “unconfirmeds” is hilarious, I would think that everyone would know everyone else in this particular fictional universe. They would gossip the heck out of the incident and know everyone’s names and their relationships with those involved. Or is this town larger than it seems? 2) In this small town, I would be surprised that the old lady would remain unnamed–unless it’s to protect the privacy of the family. Ha! In that case, let gossip take over. But I think she’d be some creepy old lady who had lived in the area for 100s of years with no living relatives. And it would make more sense for her to disappear mysteriously than never to be seen again. 3) Is an “origin” story a genre term used for a “first occurrence”? Or should the word be “original”? 4) I would cut the unnecessary “even”s in the last paragraph. They just make the sentences feel too wordy. 5) I would choose to use a shorter phrase to replace “he was adept at.” I think it would keep the writing punchier. There you go! I can’t wait to see more!!! P.S. I’m sitting at a window of the lodge at Sugarbowl, watching my son learn to ski. It’s St. Patty’s Day, and people are wearing green hats, green antennae, green bunny ears, and green beards. Some have green faces. Are zombies green? And would people mistake them for St. Patty’s Day revelers? Do they drink green beer and eat green eggs and ham? Just curious. Whether this type of community would know “everyone” is certainly an interesting idea. As a reporter, I have covered several communities of the type I’m writing about. One of the towns was exactly as you described it; everybody knew everybody else. The others towns, not so much. I am, however, intrigued by the concept of the townspeople knowing more than their newspaper coyly reports. Lots of fun possibilities there. As for the rest, your ideas are spot on about punchiness. I also made the two corrections you pointed out. Many, many thanks, my friend! The “Dogpatchers” are the Dogpatch Writers Collective, formed by a group of aspiring fiction writers headed to MFA programs back in 2000. The name “Dogpatch” comes from the neighborhood in San Francisco where we first held our meetings, and where I still live. We clicked as a clique, so we continue to critique each other’s work. A few years ago, one of our members moved to Washington (the nerve! ), so the group now meets via Skype. We post an assortment of notes on the writing craft and critiques at http://www.dogpatchwriterscollective.com. Thanks for the explanations. There is, of course, “method to your madness” as my mother would say. I can’t wait to see where you go with this! Oh, I am so following you people! Yikes! I thought it was a though, though I thought incorrectly. Absolutely awesome! Now do you tie up your A18 page loose thread later on. Is it significant? I can’t wait to read more. Your zombie on the roof story is cool too. You’ll have to swap notes with Jack Flacco. Zombie writers must be psychic to each other lol. I agree with the previous comment about paragraph 2 being too vague. It was instilled into me to be specific. Even for a one sentence comment on a character you never see or hear of again, a name makes all the difference. The winking street light does sound odd. Either blinked on or winked at him, but winked on jars the flow of the paragraph. And, every family should have a hearse. Love it. I’ve never read a zombie book either, save for Max Brooks’ The Zombie Survival Guide, which, let me tell you, is surprisingly thorough. I hear you, Pete. Paragraph 2 does need cleaning (as does the entire manuscript) but the vagueness was deliberate and factors into the main story later on. Thanks! And trust me, I know small town papers. Love it, love it, love it! Just got back from Megacon so I’m all pumped up for more zombie stories. Actually, my conversation with mom was quite amusing. She even had to drop the “I’m irritated with you” act once I read her the grandma part of the story. Dad, of course was delighted with the post. The Reapers Are the Angels. Best. Zombie. Book. Ever. Yours, a close second. For sure. Never read it. But I will happily accept second place for most anything! Glad you liked it, Cathy! Wow –that is so cool that the flash contest gave you the seed of an idea that would eventually grow into this novel! I am over the moon that you’re writing a YA zombie novel. *grins* You know how YA-obsessed I am. Your intro is great. I love how Silas hops into a hearse to go to Home Depot. If you need an extra beta reader when the dust settles after your first (or umpteenth) draft, let me know! Many thanks for the beta read offer (which I happily accept)! But please don’t hold your breath for it. This is a story I am doing *between* other stories. Oh, and do feel free to do more Flash Fiction contests! (If you ever want to do a Thanksgiving-based one, BTW, I’ll donate a signed copy of “Sarah Gives Thanks” for the cause. 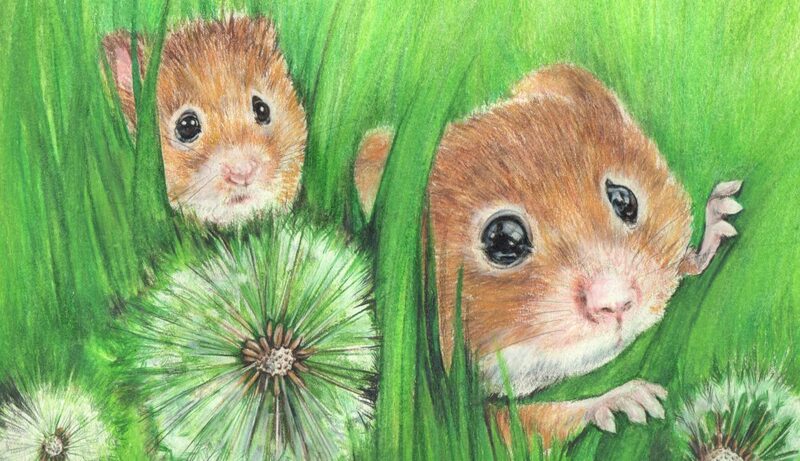 Oooh –and as always, I love your artwork. 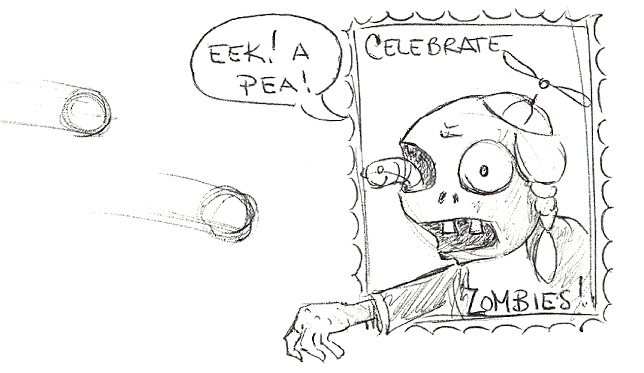 Peas are surprisingly effective against zombies. Very true. I am surrounding my house with violent squash as we speak. This is the awesome, Mike. I love the tone, I love the asides, and I’m loving that Silas was up at 5am (Doing what? Embalming? Forcing himself to read the paper? ), that he has to hoist his frame out of a La-Z-boy, and that he drives a hearse. Keep going, please! And if you need a beta/test group, you know where I am. I like it SOOO much! And I relate about the blogging world being responsible for us broadening our writing horizons – If you remember, I wrote that dragon story as an entry for a writing contest on another blog, and I had never considered writing about dragons before, but ended up really having fun with it. Hope you carry on with this one. Very funny in a dry (if occasionally gummy), clever, witty kinda way. I think it’s a goer for sure…so please sir, I want some more:-) Brain not capable of more specific feedback right now. Thanks, Harula! Glad you like it! The zombie thing just eludes me. But you never know where this crazy blogging thing will take you, do you? But as long as you enjoy the ride, who cares? Gotta love a guy who has the mellow to decide to board up his windows in the morning. As much fun as we may make of them, zombies are just plain fun. Keep them coming, my friend! As as you might have guessed, our friend, Ethan, has a bit of a drinking problem. But there’s nothing quite like being stranded on a roof to make a guy quit cold turkey, is there? Exactly, and you’ve chosen a great vantage point for him to gain new perspective in between shaking spells and battling off those pesky undead. Your comment made me snort. But you’re right, of course: The undead ARE pesky! If I have caused you to snort then my work here is done. I love your writing; I love your wit, intelligence, insights that show through in your writing; I love your stamps; and I love flash fiction. I just hate zombies. Zombies scare me. It’s the ‘too imaginative’ party of my personality. If I read about zombies, I see them all over the place (because according to many authors, books, movies, TV shows, they ARE all over the place). Therefore, I could not read all of your zombie story. Sorry. I like to sleep at night (okay, my weirdness is showing through. Something to do with growing up in NJ….). Oh, dear, Pam. Fear not. As the snippets above suggest, it shall be a comic novel. I have no plans to horrify or gross anyone out. That’s not my bag at all. Still trembling. How about if there are worms in your bag, or worse yet….maggots????? If I ever ask you to beta read, I will cross out any and all references to maggots. We’re friends; it’s the least I can do! This was so good. Make them vegetarian zombies, and then the kids use them as their minions to eat veggies for them and take over the veggie eating adults. The grown-ups will never see it coming. Then there will be eventual world peace because kids will rule the world and there will be free ice cream everywhere for everyone. Just thinking. Well, that’s one way to go! And many thanks for your kind words, my friend! I couldn’t fit a single cow in my home if you paid me, so let’s just forget about that part, k? I love the zombie stamp. I think its my favorite so far. Celebrate gumming. Hm. I’ll need to think about that.